Back in the 19th century, well before Centrelink and the Australian Labor Party, the social welfare of the working class was rarely at the forefront of the government’s mind. In industrial suburbs like Footscray, it meant the wellbeing of the poor often fell into the hands of their employers. Though a quick glance over a Charles Dickens novel might lead to the assumption employers would do whatever they could to avoid spending their money on workers, it wasn’t always the case. Drawing inspiration from James Cuming – farrier, fertiliser maker, politician and Footscray Football Club benefactor – The Patron looks to those capitalists who sought to give back to their community when they were down on their luck. The beer was brewed as a collaboration between the Footscray Historical Society and Hop Nation and is also the newest member of the brewery’s core range. At the time of writing, it was being softly rolled out around Melbourne with the possibility of a wider release in the not-too-distant future. 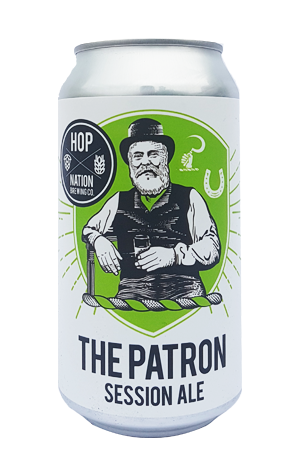 Like a jaundiced farrier from a century and a half ago, The Patron is a light and pale straw colour. At 3.5 percent ABV, it’s a beer with a lean malt body and a focus on tropical and fruity hop flavours that deliver some peach, honeydew melon and a light level of pine.